During World War II, the Irish Government had declared that the State would remain neutral. A series of look out posts were erected around the coastline, connected by telephone, to monitor and report all sea traffic to the Irish Coast Guard. The majority of these LOP were built to the exact same plans and were completed between 1939 and 1942. Follow this link for further information and the exact locations of other WWII lookout posts throughout Ireland. Many are still standing in various state of repair. The recent maintenance work to LOP 64 on Downpatrick Head has helped to preserve this piece of history. 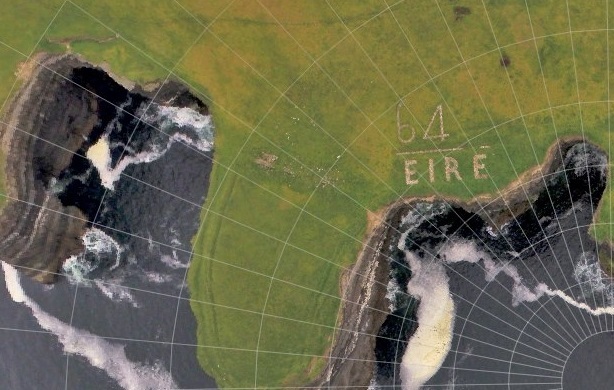 The marking "EIRE 64" as clearly seen in the image was an indication to American aircraft that they had reached Neutral Ireland having crossed the Atlantic Ocean.